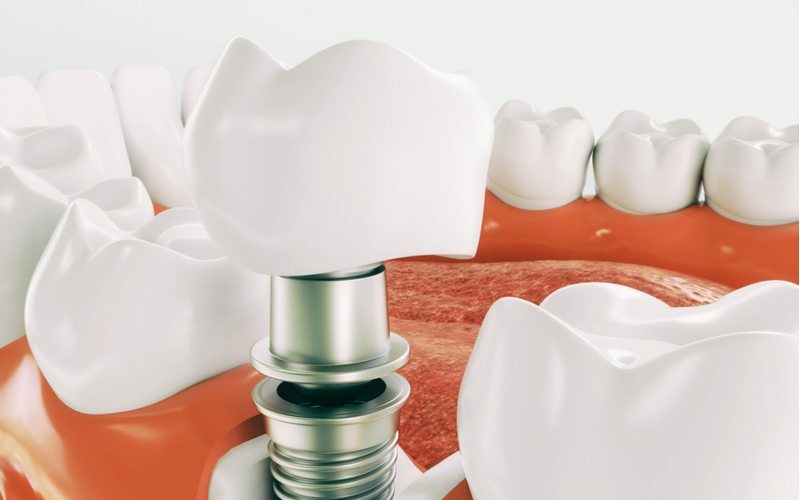 Dental implants offer patients a permanent solution to tooth loss. They can be used to replace a single missing tooth, several missing teeth, or even an entire mouthful. The process of getting implants is lengthy, but ask anyone who has had the procedure done and they will likely say it was worth it. Why? Because dental implants eliminate the need for removable prosthetics like dentures, which slip, can fall out, and can impact the way a person sounds when they speak. But with all these benefits, as well as the necessary surgery needed to get them, how much are implants. What are implants made out of? Dental implants involve two parts. The first is a metal rod that is cemented into the jaw bone. The second is a permanent crown that is affixed to the top of the rod. What’s the process of getting implants like? Prior to getting dental implants, you’ll need to come into the office for a consultation with Dr. Zhao. She will examine your mouth and determine if you’re a good candidate for the procedure. If you are, she will then put together a treatment plan with the price estimate. Typical treatment plans include coming into the office for a visit in which the rod that holds the permanent crown is placed. We often will have to do a bone graft to ensure the rod has a stable foundation to be placed. Once the rod is placed you take a few months to heal. You’ll then come in for a final visit in which your permanent crown is placed. The cost of your implant will depend on which tooth is being replaced, how many are being replaced, and what sort of preparation is needed during surgery. Each of these factors plays a role in the total cost of the procedure. No, insurance does not typically cover insurance because they are looked at as elective options for tooth loss. Dentures are the most common prosthetic covered by dental insurance. How do patients usually pay for dental implants? Patients usually pay for dental implants using cash, Care Credit, or credit card. We can help you figure out a payment option that works best for your needs. What should I do if I want implants? If you’re interested in getting dental implants, contact us. We can help determine whether these are the best options for you. If they are not, we’ll point you in the direction of other prosthetic that will deliver stellar results. Previous Post: What Is Halitosis?